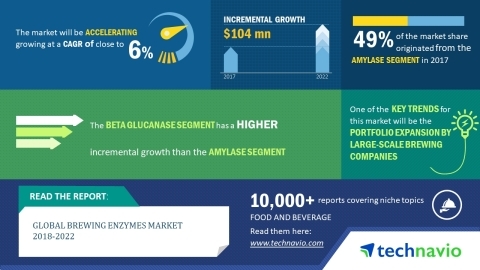 LONDON--(BUSINESS WIRE)--The global brewing enzymes market is expected to post a CAGR of close to 6% during the period 2018-2022, according to the latest market research report by Technavio. A key factor driving the growth of the market is the use of brewing enzymes to optimize brewing process owing to an increase in cereal prices. Brewers are constantly seeking cost-effective solutions to maximize brewing capacity and accelerate the brewing process to produce high quality, stable, and clear beer with minimal wastage. The increasing prices of cereals which are a key ingredient in the brewing process has made it crucial to identify methods to increase the efficiency of the brewing process and thus beer production. This has led to an increase in demand for brewing enzymes as they help in optimizing the use of raw materials. Brewing enzymes added exogenously help improve efficiency at different stages of brewing. Thus, the increasing cost of cereals is expected to drive the growth of the global brewing enzymes market during the forecast period. This market research report on the global brewing enzymes market 2018-2022 also provides an analysis of the most important trends expected to impact the market outlook during the forecast period. Technavio classifies an emerging trend as a major factor that has the potential to significantly impact the market and contribute to its growth or decline. Several brewers are focusing on extending their product lines with beer products that incorporate the characteristics of traditional craft beer. Manufacturers are also seen introducing new beer products to strengthen their market positions. For instance, in November 2017, Goose Island Beer owned by Anheuser-Busch InBev, launched Bourbon County Brand Stout. In October 2017, Jacob Leinenkugel Brewing launched Pomegranate Shandy. The beer has a juicy and fruity flavor, with a hint of citrus and ripe pomegranate flavor. Therefore, with such new products, the market is expected to show a positive outlook during the forecast period. “A thriving beer industry and rising competition among vendors mandates constant innovation along with optimum production processes to ensure profitability. Therefore, several manufacturers are adopting brewing enzymes to improve brewing efficiency and stay abreast with the changing market dynamics,” says a senior analyst at Technavio for research on alcoholic beverages. This market research report segments the global brewing enzymes market by product (Amylase, Beta-glucanase, others) and by geographical regions (APAC, EMEA, and the Americas). The Amylase segment led the market in 2017 with a market share of close to 49%, followed by the Beta glucanase and others segments respectively. However, during the forecast period, the Beta Glucanase segment is expected to show the highest incremental growth followed by the Amylase segment. The global brewing enzymes market is expected to post a CAGR of almost 6% during 2018-2022, according to the latest research report by Technavio.